There’s nothing better than some fresh-picked morels lightly sautéed in butter, but if you’re looking for a way to change up your morel routine, here are some new recipes to try from the Iowa State Fair Warden’s Cook-Off and the Iowa Game Wardens’ Cookbook. Remember, it’s best to learn how to identify mushrooms (including what’s edible and what’s not) in-person from an experienced mushroom hunter. Combine all ingredients, except garnish. Mix well and chill before serving. Morel mushroom foragers will enjoy this simple dish that starts sweet on the tongue and finishes with the earthy goodness of morels. 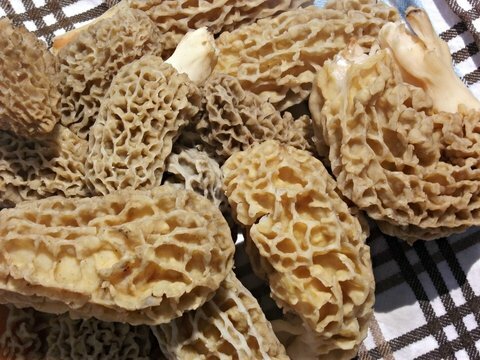 Bill Ipsen of New Hampton, an avid morel hunter, shares his recipe. Ipsen, who bakes fresh bread every weekend, often brings a still-warm loaf and mushroom paté to share with friends while trekking for morels. A perfect picnic snack, spread it on bread or crackers. Enjoy in a state park, woods or around a campfire. Mushrooms can be dehydrated and stored to create a paté later in the year, long after the last morel is harvested. Simply soak the dried morels in water until soft before use. Melt half the butter in a heavy nonstick skillet over medium heat. Sauté mushrooms and onion 4-5 minutes or until soft. Stir in sherry and simmer, stirring until liquid has evaporated. Salt and pepper to taste and cool to room temperature. Transfer to food processor or blender. Add remaining butter and purée until smooth. Transfer to a serving bowl and garnish with parsley. Serve on bread or crackers.